Welcome Spring with these fresh, colorful veggie wraps! 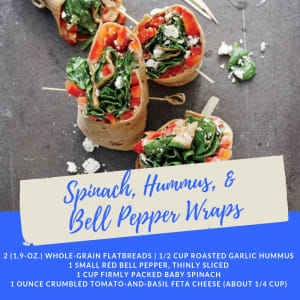 The crisp bell peppers, soft wrap, and creamy hummus are sure to be a hit for any to-go lunch or snack. Divide the bell pepper evenly between the flatbreads; top each with 1/2 cup spinach and 2 tablespoons cheese. Starting from one short side, roll up the wraps. Cut each wrap in half, and secure with wooden picks. One Serving Equals: 258 calories, 12.1g fat, 15g protein, 34g carbohydrates, 13g fiber, and 793mg sodium.